You are currently browsing the category archive for the ‘Linda Womack’ category. 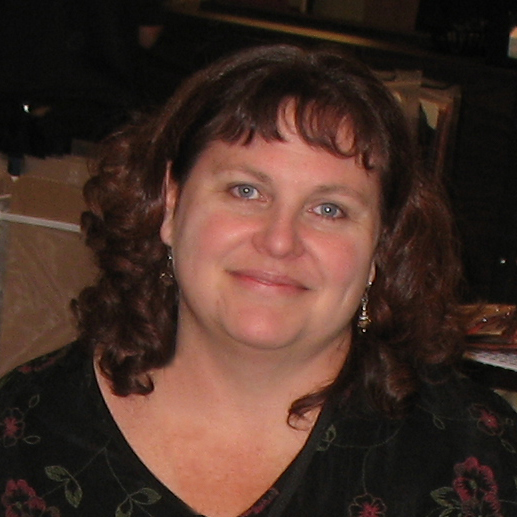 I’m so excited to be a guest blogger on the StencilGirl blog today! 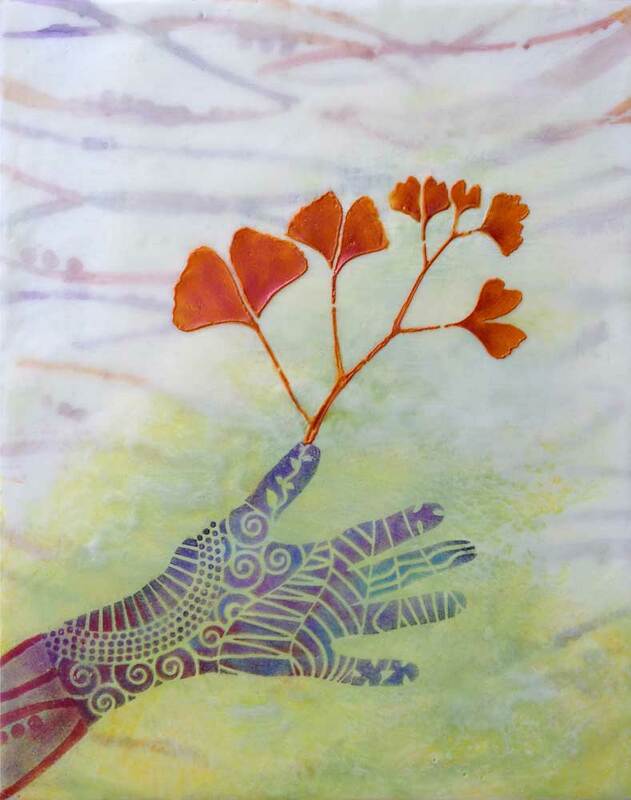 I’ll show you how to make this painting, step-by-step, using Enkaustikos wax, pigment and watercolor through the beautifully designed StencilGirl heat resistant stencils. View the full blog post here. 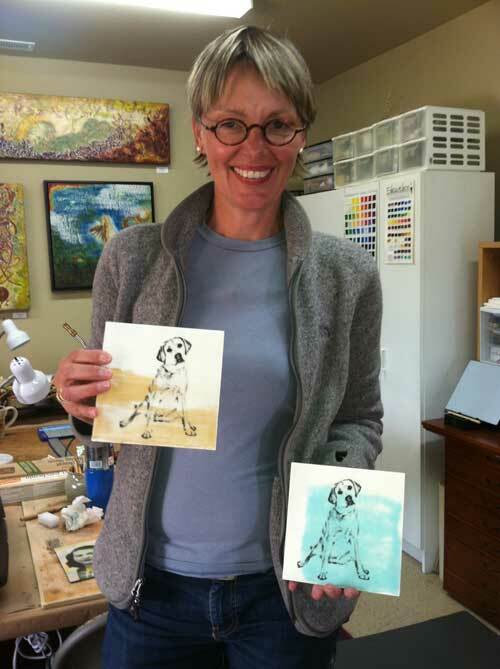 I’m also working with Enkaustikos to create the Linda Robertson Encaustic Kit that will include my favorite Enkaustikos colors, several tools, brushes, a StencilGirl stencil, and a PanPastel color plus an online video class showing you how to use all of it together! Please join my mailing list or “like” me on Facebook to be notified when the encaustic kit is available, and also to get updates on the release of my new eBook and online classes. I’m happy to announce my inclusion in a new book called 101 Mixed Media Techniques that’s just been published by Water-Foster. This expansive book features many talented mixed media artists and I’m excited to be among those invited to participate. I was in charge of the section on encaustic, focusing on mixing wax with other media. I created projects that incorporate charcoal, graphite, dried plants, rubber stamps, felt, fabric and foil. Printed books still take a long time to publish, so I had agreed to do the book quite a while ago when things were going a little bit easier in my life. When it was time to do the actual projects and photographs things were much more complicated, but a deadline is a beautiful thing sometimes, especially for me! My wonderful friend Kimberly Kent helped me so that I could take the photographs as she demonstrated the techniques under my direction. Doesn’t she have beautiful hands? And it doesn’t hurt that she and I have been friends for a long time so we had fun doing it. Another bonus is that she’s a very talented painter in her own right so she knows exactly how to hold the tools and what I was trying to teach through the photographs. Also, we might have had some wine. I’m really happy with how the book came out and I hope you’ll get a chance to see it in person. I have a few copies for sale in my studio so if you take a class in my studio ask if I have any available. Otherwise you can get it at Amazon.com or through local bookstores. What it really looks like in my studio when shooting photographs or video. I’m happy to announce the completion of a new commission work for the main lobby of Gray’s Landing, a mixed-use building in Portland’s South Waterfront by REACH Community Development. Gray’s Landing provides vital new homes for Portland’s low-income workers and veterans. This was a fascinating project! I’m one of five artists who were awarded the commission by Kent Art Brokerage to interpret a waterfront scene using different strips of the same photograph to make up the whole. We each worked in a different medium and interpreted our part of the photograph in our own style. The overall image we created is a scene you would see if there were a window where the art is installed. My fellow artists include Theresa Andreas-O’Leary, Tim Combs, Renee Hartig and Patrick Noe. A few photos taken while making the work: checking the horizon line measurement and trying out a plant image before making the transfer. Here are 4 of the 5 paintings before installation (R-L) by Tim Combs, Linda Womack, Renee Hartig and Theresa Andreas-O’Leary. This video was made during a visit of the Dalai Lama to Hawaii and is a wonderful introduction to the idea of Living Aloha that was instilled in me growing up in the islands. For those of you who ask how my life there has influenced me and my art, this is a big part of it. Enjoy!